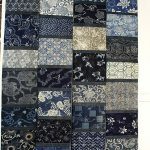 Tips for quilt competitions including FOQ. 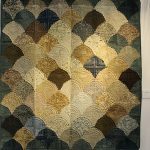 I know a lot of quilters at some point decide to enter a competition, so I wanted to offer some sound advice as a teacher and designer. 1. Follow the competition guidelines. 2. Ask the organisers if you are unsure about anything. 3. 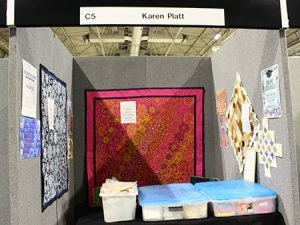 Design for the category you are entering – some shows will re-categorise your quilt if you did not get it right, others will simply reject it. So read the description carefully and follow accordingly. Here are the categories for FOQ 2018, check that they do not change. Other shows have very similar categories. 4. If it is not all your own work, if you had help in some way – say so. 5. If you used a pattern name the designer and pattern. 6. Understand the system of judging. Here is the link for judging for FOQ for example. 7. Take note of the way your quilt will be hung. 8. Check postage and insurance (these are sometimes included in the cost of entry. 9. Check the deadline for entry. 10. 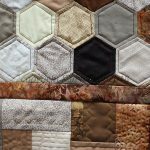 Check the deadline for submitting your quilt and for picking it up. Ask yourself if you are ready to make a competition quilt. The standards are high. 2. Are you neat, accurate and precise? 3. Can you make a straight quilt with equal sides? 4. Can you design? Ok you can use a pattern, but in my book that is cheating! 5. Be honest about your abilities and work to your strengths. 6. 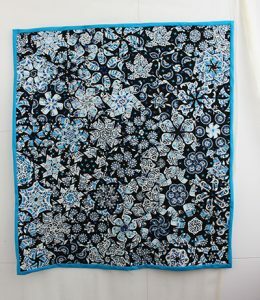 Have you exhibited a quilt before? 7. Can you do it in the time available? It is best not to overstretch yourself. 8. 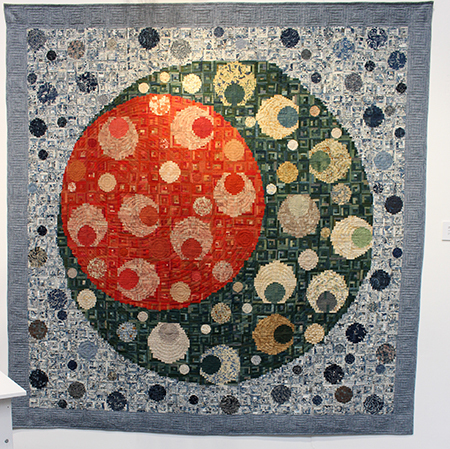 Look at past galleries of quilts from previous shows, especially winners. It will give you an idea of the standard expected. Each category in a competition has a size to work to. Measure carefully including binding if your quilt has it. For mini quilts or wall hangings, you could make a card template and check your size. Ensure if they are working in inches that you measure in inches, or in centimetres if that is what they have stipulated. Conversion can lead to inaccuracies. For example 12 inches (the size for miniatures) is normally taken to be 30cm, but accurate measurement means it is more than this, only marginally, but worth checking. 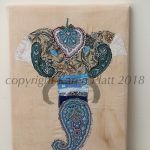 I have been a designer for over 40 years and offer ecourses in textiles and quilt design, workshops overseas as well as tutorials, blog and more. Online ecourses means you can enjoy them wherever you live. 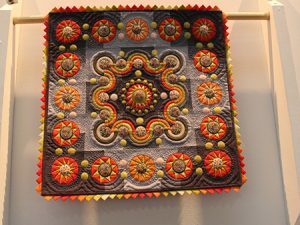 Festival of Quilts – these quilts were the best in the show for me. My choice not that of the judges. I often look at the winners and think why? Every person deserves recognition for entering – it is a huge feat to make a show quilt, so well done to everyone who entered. 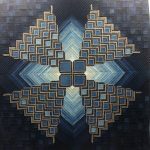 Apparently there were 700 quilts hung at this year’s exhibition. That’s quite some eye candy. I did not see them all, let alone photograph them all. Some I did photograph were not there for judging anyway – they were in the galleries. 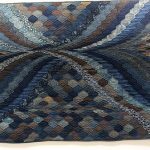 I am going to start with one of those galleries, because the very best quilts I saw at the show were the work of Shizuko Kuroha, a Japanese quilt artist whose quilts are undoubtedly an art. Her gallery was simply amazing. 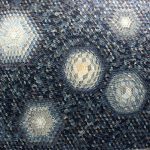 For me, nothing quite compared, even though many of the quilts were fantastic, Shizuko’s quilts were the highlight of the show. However, there were many I liked. 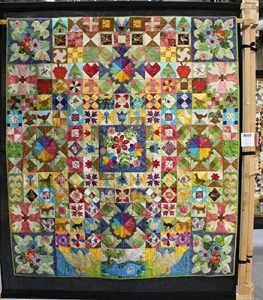 I loved this quilt but designers’ names were still hidden during the judging process, hence I do not know the maker. It was the roses that did it for me. 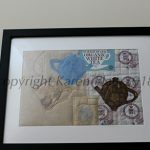 This was another I just fell in love with, this time it was the colour and quilting that stood out for me. 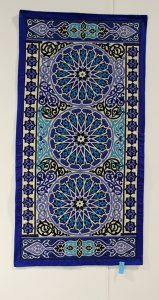 The Cairo tentmakers were there this year and with my strong connections to Islamic architecture, ceramics and calligraphy, I could not resist. 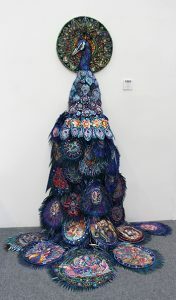 Two favourites at the show were not wall or bed quilts but art quilts, the peacock by Nikki Parmenter, an incredible artist. 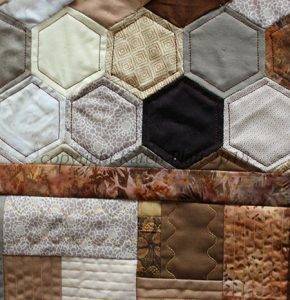 In my humble opinion this kind of quilting simply does not get enough media cover at the shows. 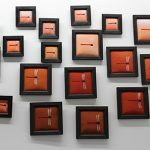 The other was the incredible work of Kathy Knapp. It just took my breath away. 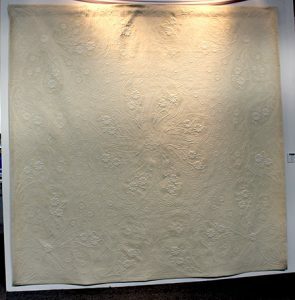 The show is very heavily traditional based and there were wholecloth quilts that were stunning. Sandy Chandler’s Cachemire was amazing. 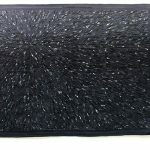 It is often difficult at the show, especially if you have never used one, to know what has been long armed and what has been made in the traditional way. Sandy is a longarm quilter. 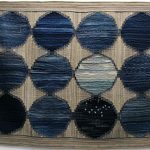 I loved Phillippa Naylor’s miniature quilt, such tiny pieces, all so very neat. I could go on and on, but I will make the last image one of my own (the main image above), shown on my stand for the very first time. Visitors comments were ‘amazing, brilliant, fantastic, impressive’. 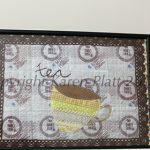 My OBW quilt tutorial can be found online. 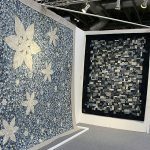 If you are thinking of exhibiting next year, why not join my design ecourse, wherever you live, this course is taken online at your own pace with tutor involvement and will help iron out the problems facing many quilters – colour, options, balance, arrangement and all aspects of quilt design. 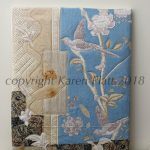 Next week the blog will be all about my first year as a professional quilting tutor. 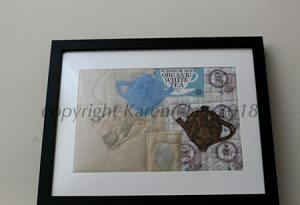 Words, images copyright Karen Platt 2018. Quilts copyright the individual makers. 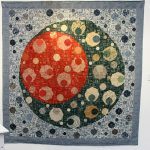 Festival of Quilts – my lowdown on the ins and outs, up and downs of exhibiting. 3. If you are a hobbyist, do not even think of a show like this – it is extremely expensive and not for non-professionals. You need a professional display and this is a learning curve. 4. What do I mean by expensive? The smallest stand will cost in excess of 1,000 pounds and you might only get a tenth of that back (like I said it is not about sales). Sellers deserve every sale because without them the show would not exist. 5. In addition do not forget electricity, card reader, hotel, travel costs to and from the show, food, parking (that alone cost me over 40 pounds for two nights when my helper came and insurance (obligatory). You will also need promotional materials and banners etc. reliable internet connection is charged as an extra. Do not make your leaflets and literature date or show specific. 6. Long days are hard on the legs, staring at the opposite wall if you hate this sort of thing. You have to be willing to engage often unwilling visitors and have stamina and a lot of patience. Just set up and take down are a nightmare. I think meeting people is the most enjoyable experience. A competition might engage people and be a talking point. 7. Don’t forget to get across your message and communicate. 8. A professional stand means potential customers will engage. No handwritten signs and make sure all quilts displayed are of a professional standard. 9. Have someone with you so that you can have a rest, go and eat and use the loos without worrying about your stand. 10. Don’t believe everything people say about shows. There are lots of people who talk of nothing but theft at the shows, I did not have anything stolen. It is tough work and hard to recover the costs of exhibiting, no matter how hard you work. Sadly most people visit for ideas, yet the trade stands are the only reason the show exists. Have a range of items from low cost upwards to hopefully make sales. Above all enjoy it, it is an unforgettable experience. Just enjoy it. Next week – don’t miss my pick of the best of the show. 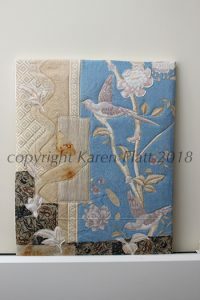 Images have been posted in the Quilting Design Course fb group, for those who are members. 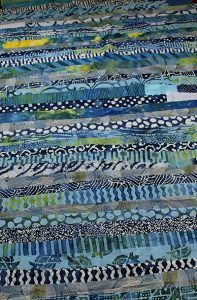 Festival of Quilts. It’s the final countdown. The show starts on Thursday and I have to have the stand ready at the end of Wednesday for the big day. It’s been all work and no play here. I am well and truly exhausted. 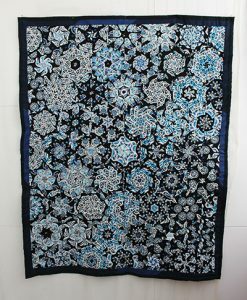 I’ve done so much sewing of quilts, I am not sure if I can remember it all. 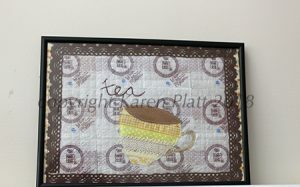 I finished all the small textile quilted pictures. I even fitted in a new one yesterday. It was a week of ‘how do I finish this?’ Often we ask ourselves the question ‘Is this finished or does this need something else?’ Fortunately I found just what I needed. The bird quilt was enhanced with some applique. 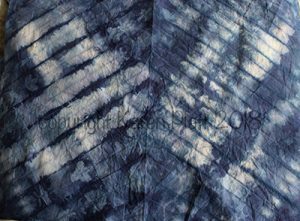 I ironed again and folded all the hand dyed fabrics. Just that alone took hours and hours. I made labels for the work. I have dyed and cut more fabric. It’s all looking good. There are one or two unfinished quilts but I am only human. The unfinished new quilt and hand stitched calico quilt will either go as samples or as photos – I have not decided which yet. It all rather depends on how it fits into the transport. I have spent my day today designing posters for the back wall of the stand at the show and finishing the brochure. I also framed two quilts and blocked two quilts onto canvas. 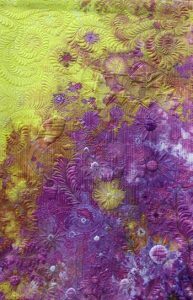 Great news is I will be promoting the textile quilting holidays that I am leading. 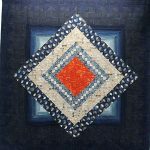 I am teaching in France in November this year – on the 5th for a week – quilting inspired by the Romanesque churches of the Charente region, and the following week, commencing the 12th, I am teaching cave paintings on a variety of fabrics. In January 2020, I am leading a tour for block printing in Jaipur, India. Come and join me. See you on Stand C5 at the show. I will try to blog from the show, but no promises. When one of Yvette Stanton’s book drops into my letter box, I know that I am in expert hands. She is my number one world embroidery lady. We are all in for a treat. 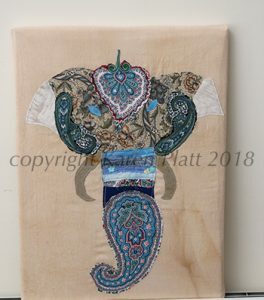 Yvette’s guides to traditional embroidery are superb. Discover the colourful world of Norwegian pattern darning – Smoyg. Find historical photos, learn the stitches and techniques and 13 original projects to hone your skills. In her third book on Norwegian embroidery, Yvette shines a light on the subject of folk embroidery. This educational book offers clear and concise step-by-step instructions, inviting you into the charming world of this traditional technique. Yvette simply gives the best charted designs I have ever seen in any book. See the variations of Smoyg, where it hails from, its history and forms. 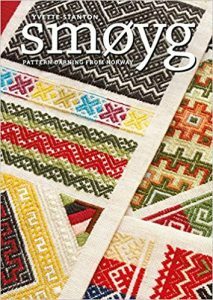 Learn the motifs and fabrics to use for authentic smoyg. See how to use them in useful and practical projects – a jewellery bag, needlecase, table runner, pendants, band sampler, bookmarks, hanging ornament, table centre, cushion, shirt collar, framed square and scissor keep. An exciting array of projects to appeal to everyone. I think I will start by making the colourful band sampler – it is my favourite project. I am quite tempted by the thought of hanging ornaments too. 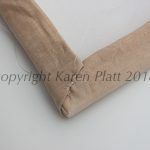 There is also a guide to thread and fabric compatibility and a pattern sheet. Highly recommended – this year’s must buy embroidery book.